Why is it so hard to understand the world? Do I really understand the facts of current events? Do events taking place far away affect my life? 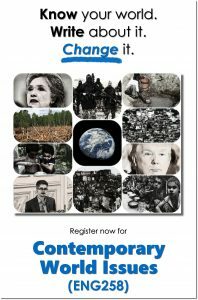 Contemporary World Issues (ENG 258-41) will give you the tools and teach you the skills to engage with the world and change it for the better. This course is excellent choice for students interested in journalism, politics, area studies, social science, or communications. It is well-suited as part of an education geared for careers in mass communications, humanitarian relief, public relations, broadcasting, or journalism. Or just because you want to know about the world you live in. Offered FL WI Lecture-3 (3 credit hrs/3 contact hrs) Lab-1. (Prerequisite: ENG 112 English Composition II or instructor approval.) This course is a writing-intensive, multidisciplinary exploration of current world events that prepares students to better understand and participate in the democratic process. Students learn about and use a variety of news gathering technologies to rapidly isolate, track, analyze, and interpret emerging issues of global concern and to compose high-level written analyses of world events in appropriate cultural, political, scientific, and economic contexts. The one-hour lab focuses on real-world application of course content to a specific area of student interest in humanitarian computing. This course is a writing-intensive, multidisciplinary exploration of current world events that will prepare you to better understand and participate in the democratic process. You will learn about and use a variety of news gathering technologies to rapidly isolate, track, analyze, and interpret emerging issues of global concern and to compose high-level written analyses of world events in appropriate cultural, political, scientific, and economic contexts. The one-hour lab focuses on real-world application of course content to a specific area of student interest in humanitarian computing. apply acquired skills to recommend appropriate responses to newly developing events. Text: TBA; ancillary materials will be made available on the web. Materials: a notebook (for lecture notes); a blank notebook for journaling; and wireless-capable tablet or smart phone (current Android operating system preferred). Analytic Reports will be graded according to how well they exhibit certain aspects of clear, meaningful writing, such as organization, content, and style. Prior to submitting the final draft of each essay, we will engage in a workshop (peer review) exercise. I will generally require that near-final drafts of your essays be submitted on Canvas. Final drafts will be submitted on the College’s learning management system, Canvas. (You also will be required to submit your essays to turnitin.com, West Shore’s plagiary detection service.) In general, I configure the service to show you where you may have inadvertently plagiarized. This gives you an opportunity to revise your essay and resubmit it before it is graded. After I have graded a paper, you may sometimes revise it for a higher grade. However, this option exists at my discretion (and my choice will be influenced by your previous involvement or engagement in class activities, your current grade on the paper, how near we are to the end of the semester, etc.). If you are interested in revising a paper, please get in touch with me. Participation refers to any assignments not accounted for in other elements of the grading scheme above and include such things as reading assignments, exercises, class discussions, and workshop exercises. Participation in these activities will help you understand and internalize the course materials. Of our many in-class activities, workshop (also known as “peer review”) is of utmost importance. Failure to be prepared for, attend, and fully participate in, a workshop exercise will mean a loss of one letter grade on the final essay in addition to any penalties for missing class. Quizzes will be short (about 10 objective-type questions). They will cover material from reading assignments, lectures, and class discussions. Some quizzes may be “pop” quizzes in class; others may be online. I will inform you about the mode of the quiz ahead of time, when necessary. The Midterm Exam will take the form of an impromptu analysis of a current event, the nature of which will be unknown until the day of the exam. The Final Exam will be comprised of a combination of multiple-choice questions similar to those used in the quizzes and another impromptu analysis similar to that used for the midterm. Extra credit may be available for this course. Generally, it improves your grade by a maximum of 2%. Grades will be maintained throughout the semester on the college’s learning management system. Three late arrivals will equal one absence. I would like this class to be fun, even though we do some serious work in it. I would also like it to be relatively relaxed as that is probably the best atmosphere for learning how to write. However, if you feel that you are not doing well or that you do not understand something, please come see me during office hours, call me on the phone, or send me email. I’m sure I can help you. This entry was posted in Current Projects, News, Teaching & Learning by WSCC Faculty Net Admin. Bookmark the permalink.